Like many animation fans the world over, Beauty and the Beast is one of those special films that holds a place in my heart. Depending on what day of the week you catch me, I may tend to consider it my favorite Disney animated feature of all-time. It’s a film I can put on and sit through from start to finish at full attention with a smile on my face. Roughly fifteen years ago I saw the stage musical adaptation of the film on Broadway as part of a birthday run and was mesmerized by the wonderful performance. So it was a no-brainer that I was going to see the live-action feature film adaption the second Disney announced it. Disney has been on a bit of a winning stretch with adapting their classic animated features into live-action films lately. Tim Burton’s Alice in Wonderland scored a billion dollars world-wide, Robert Stromberg’s Maleficent was another box-office hit, Kenneth Branagh’s Cinderella was a faithful delight, and Jon Favreau’s The Jungle Book was a visual majesty. Even David Lowery’s reimagining of Pete’s Dragon was a charming success. Surely Bill Condon, whose experiencing in adapting musicals into live-action features include writing Best Picture Oscar winner Chicago and directing another Oscar winner in Dreamgirls, could maintain the momentum by taking on the “tale as old as time”. Coming out of the theater, I felt that I liked it enough to consider it a good film. It wasn’t bad at all, but I was bothered by its flaws and missteps, some of which really didn’t need to be there in the first place. A lot of the folks I saw the film with seemed rather happy with the results and I’m pretty sure we all had the same expectations that this would be great. So maybe it’s my own feelings as a fan of the original animated film, as well as being an animation fan and a film fan in general, that makes it hard for me to excuse the things I didn’t like about this adaption. Regardless, I think we ended up with a film that was too ambitious in trying to live up to the hype that it was hampered by glaring mistakes. The misstep most folks will be most familiar with, if you go by Internet comments, are the songs. We know them by heart, from the lyrics to the rhythm to the tone. So the initial challenge would simply be to find voices that would hit all of these notes just right. There was a lot of questions about the singing abilities of Emma Watson going into the film, and the obvious auto-tuning certainly didn’t help, but I found that was far from my biggest issue. For some reason, they tried to expand the songs in some fashion. Be it additional lyrics or drawing out a break between lyrics or even singing them a little slower, the timing is much different than what we remember. In Be Our Guest, when Mrs. Potts is singing her verse, there’s a point where the singing pauses for several seconds so that there can be this sort of slow-motion ballet visual with the music shifting to accompany this. Why? What’s the point? It served no purpose than to disrupt the flow of a song we’re tempted to sing along to. Maybe it’s because of the format upon which I saw the film, but a glaring flaw that bothered me big time was the character animation. How could this be possible? From Disney, no less. A good portion of the time, I’m watching the animation to Beast and I’m wondering if they forgot to go through a final render. He doesn’t come off as even trying to be photo realistic, rather he looks like the kind of CG character you would see in a television series. Not necessarily terrible, as Disney animated television nowadays is really good, but this is supposed to be a feature film. I do concede, though, that perhaps it was done with 3D viewing format in mind. I imagine everything would have looked fine had I been wearing 3D glasses. But I saw it in IMAX and that made the visual flaws all the more apparent. And the other misstep to the film was there being just one too many opportunities to expand upon the narrative that were abandoned almost as soon as they were introduced. The Enchantress appears to have an expanded role, but it’s never explained why. It’s like she has a couple extra scenes and the rest is merely implied. There’s a potentially interesting, if clichéd, backstory about the Beast’s upbringing to explain his behavior that could’ve been explored. Instead, it’s just merely mentioned by Mrs. Potts and that’s all we need to know about that it seems. These are just a couple examples that illustrate the strange manner of the narrative. As if it’s trying to introduce new elements to the plot, but is prevented from going any further because it would deviate from how faithful it apparently needs to be to the animated feature. So if these things were really bothersome to me, why is Beauty and the Beast not on the level of disappointment as Batman v Superman? It’s because there were enough positives that were rather enjoyable. The one that really sticks out to me is the production design and art direction. Sure the enchanted objects aren’t the most pleasing designs, certainly in comparison to how they look in the animated feature, but I thought they sort of worked with how the rest of the film looks, as well as with the addition to the narrative that the enchanted characters become less human each time a rose petal drops. The vibrant, yet gothic approach to the decaying castle is absolutely beautiful and wonderfully realized. And the costumes look fantastic, at times fitting the personalities of the characters just right. Step away from the songs and I felt the cast lived up to the expectations placed upon them. In that respect, Emma Watson is well cast as Belle. She hits all the right acting notes, providing enough of a slight vulnerability and still maintaining her head-held-high self-belief that make her all the more likable. 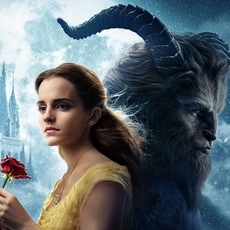 Dan Stevens is pretty good as the Beast. Even when the character animation doesn’t look as good as it should, Stevens is nonetheless able to jump in and really go to town at accentuating the character’s anger, despair, and later caring epiphany. Obviously there was work done to make his voice sound right, but the acting makes it seem natural enough that it’s hardly a second thought. Luke Evans is a favorite as Gaston. Clearly he was having so much fun with being pompous and arrogant without going too far over-the-top. I even enjoyed his singing, too. He must’ve found footage of when Hugh Jackman played Gaston on stage and took notes. The rest of the ensemble sounded and looked like they were having fun as well, providing the kind of support that allowed them to stand out enough without trying to upstage the leads or the storytelling. One might wonder if Kevin Kline was phoning it in here and there, like when he was being chased by the wolves, but I rather thought he had a little glee in him when encountering an enchanted object for the first time. While I have issues with additions being forgotten as quickly as they are introduced, thereby hampering the narrative, the overall storytelling remains familiar enough to enjoy from beginning to end. Take out the song sequences, and there’s a good romance tale unfolding. I really like the time it took for Belle and Beast to grow affection for one another through small conversations, visits to the library, and exploring their surroundings. Some of the dramatic stuff, including Gaston’s desperation to do whatever it takes to get what he wants, play out in an interesting manner that helps get through the rough patches. Though the songs seemed off, the music score by Alan Menken wasn’t. Seemingly taking a cue from the work he had done for The Hunchback of Notre Dame stage musical, he really got a chance to explore some haunting and gothic melodies to enhance the scenes. In a lot of ways, his music is what really made the film enjoyable to watch. He knew audiences loved the original themes, but was mindful in creating new ones that would be attractive. 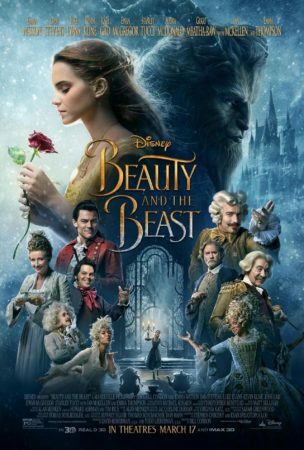 Is this version of Beauty and the Beast a good movie? I’m willing to say yes. It’s certainly not a bad film. But the hype and ambition got to the filmmakers as they created film with flaws and missteps that are glaring and rather hard to excuse. While the songs were unnecessarily tweaked, the biggest fault may have been with the character animation as it doesn’t look like CG that belongs in a feature film. Fortunately, the worthy ensemble cast, Alan Menken’s haunting melodies, and the beautiful production design keep the film from faltering too much. And while I’m bothered by interesting additions not being expanded upon, the narrative still manages to work. I just wish it was better than it was.